Just over a year ago, ASUS made some big waves in the mobile computing world with the launch of the Eee PC. The idea was to make an ultra small laptop that could provide "enough" computing power for a very low price -- something like an oversized PDA but with a full OS and a standard user interface. The concept seems simple and obvious in retrospect, and the Eee PC has created an entirely new category of laptop: the netbook. Competition in this market that ASUS spawned has become fierce, with Dell, HP, Acer, and others now shipping netbook PCs ranging in size from the same 7" chassis as the original Eee PC up to 10" models. One of the interesting corollaries to this whole story is the ultraportable market, typically consisting of 10" to 12" laptops designed for corporate users that want mobility and a lightweight form factor above all else. We've reviewed a few of these laptops over the years, and we always end up with the impression that, sure, these things are light and offer good battery life, but performance is often terrible and frankly the cost is often a major deterrent. It's not unusual to see prices upwards of $2000 for such a laptop, so mostly they end up in the hands of corporate employees. So we now have the $300 to $500 netbook and the $1500+ ultraportable markets, but there's a gaping hole for those that would like a small, inexpensive PC like a netbook, but with better quality, features, and performance. 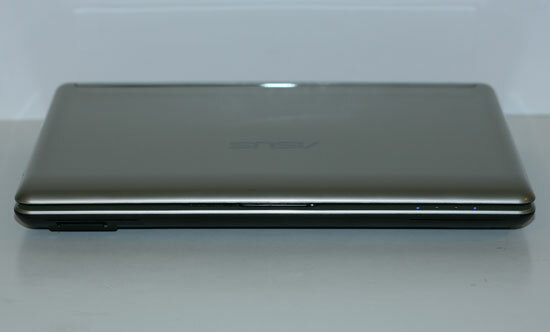 Enter the ASUS N10JC, which ASUS is billing as a "corporate netbook". What makes this more of a corporate netbook than something like the Eee PC 1000? Only a few minor differences, really: an exterior that looks a little nicer, a larger battery, a fingerprint scanner, and a two-year global ASUS warranty. Those are all nice things to have, certainly, and alone they might be enough to convince people to shell out the extra money. There's a bit more to sweeten the pot, however, like the inclusion of an NVIDIA GeForce 9300M GS 256MB. The LCD panel may also be a bit better -- certainly the N10JC has a good panel, but we haven't personally used the Eee PC 1000 so we're not sure if it's the same panel or not. The entire package is still very reasonably priced too, at just $650. The interesting question is going to be how well this netbook performs in comparison to some of the ultraportables we've reviewed, like ASUS' own U2E and U6V -- both laptops that cost over twice as much. Just wondering why the article is stating that the 945GME chipset is used, contrary to Asus' spec page which has it using the 945GSE? Sure it's not all that much of a difference, just 1 watt on the TDP and a smaller package. Well, the reason for limiting the configuration to 1GB was almost certainly to save a pin. Support for 2GB would require one more addressing pin, which in a low cost product is significant. It also may well have been somewhat a marketing decision - it's a constraint that can keep the platform from growing upwards too far performance wise. ... but smaller companies might. Large corporate IT departments have their own "procurement" sub-groups which handle IT equipment purchasing. These groups generally buy in bulk, say 100-200 notebooks at a time from companies they have service contracts with like HP and Dell. They buy for considerably less than what consumers pay in the retail channel. For $700 they can buy a considerably better equipped notebook. These groups generally make purchases with a "one size fits all" attitude, therefor, netbooks are out as a software developer won't want to be doing all his work on a tiny netbook - the same goes for an accountant or an attorney. Ergo my first comment on this article. There's a 800 dollar business version though not perfect because too low res for business and lack of 3G modem option, with VB, 2GB of RAM and a 320GB drive that I would have rather saw reviewed instead of the consumer version.